Queen among vegetables, cauliflower, is very useful. It contains all the vitamins the body needs. Cauliflower is easily digestible, so it can be used for people with diseases of the gastrointestinal tract. On top of that, this vegetable is very tasty. And if it bake with whipped cream – you will get delicious dish. 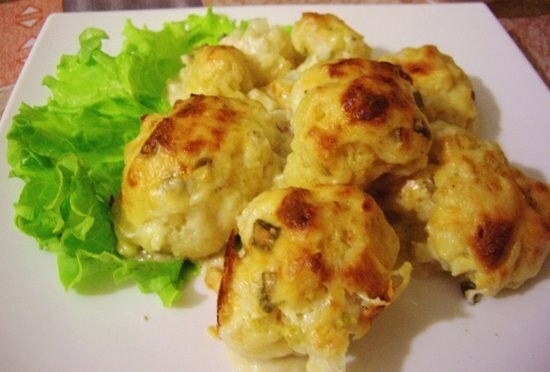 Moreover, the prepared cauliflower in cream very easily and quickly. First, turn on the oven to 180 ° C, may is warming up. Meanwhile in a deep pan put a small head of cabbage (you can use frozen product). Grease the pan with oil is not necessary. Place it, filled with cabbage, in the oven for 10-15 minutes. Then pull it out. Warm cabbage disassemble on inflorescences, salt and pepper to taste. Take 200 - 250 grams low-fat cream, them pour the cauliflower and put back in the oven now for 20 minutes. Meanwhile, grate the hard cheese (100-150 grams). Then carefully remove the almost finished dish, sprinkle with cheese (you can mix). And put in the oven, which switch on low heat. When you see Golden brown – cabbage ready to finally. Remove from the oven, transfer to a dish or spoon portions into bowls. Looks nice cauliflower in cream on the lettuce. If desired, sprinkle with greens of dill, parsley. Serve as a separate dish. As a side dish to meat, fish, mushrooms –it is also possible, but will be too rich in calories.